Why so serious indeed? Who needs to wear a classic boring t-shirt when you can have the joker right on it? This woman's Joker t-shirt is from The Dark Knight movie. This black Why So Serious t-shirt is made to fit women as any t-shirt should. This woman's t-shirt is 100% coton, so we ask again: why so serious? Il s'agit d'un produit sous licence officielle Batman / The Dark Knight. Si vous choisissez de recevoir votre "Joker Why So Serious? 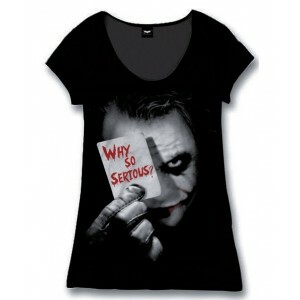 woman t-shirt | The Dark Knight" via Lettre Suivi, les frais de ports seront seulement de 2,95 € ! Votre Joker Why So Serious? woman t-shirt | The Dark Knight est en stock !